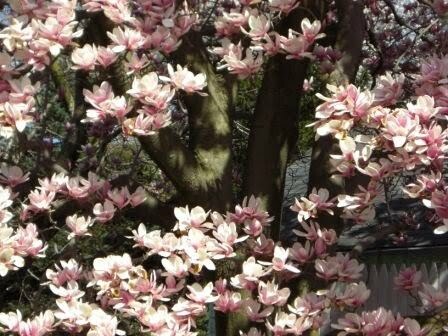 Okay, I know tulip magnolias are SO last week, but at this point so is our move . 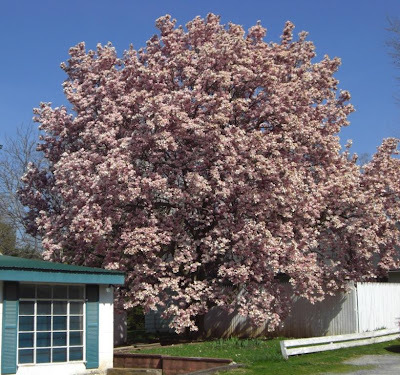 This huge magnolia tree is what I'm going to miss the most about the place we were renting. It is so beautiful and magnificent and this was its best year ever. I'm glad I took a few moments out from packing and cleaning to get a few more shots. Two days after we finished moving all of the blossoms were gone. It's almost as if the tree was saving its best for last, just for us. It will be nice to have one good memory of our time in that house. I wonder if it would be possible to air-layer one of the branches of that tree? It is a tree that definitely deserves to be cloned, for the greater good of mankind. Wow, that tree is a flowerpalooza! 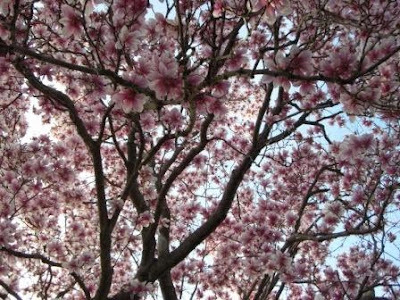 Maybe you should plant one of these pink trees at your renovated house. 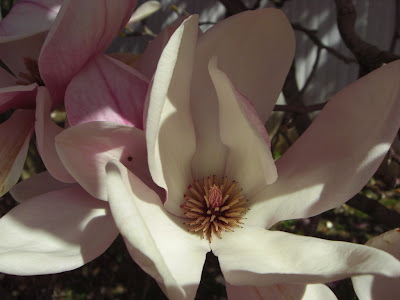 Even though they bloom for such a short season, they are so impressive! How does it feel to be back "home"? What gorgeous blooms! I'd miss the tree, too, but what a reason to leave. Congratulations on the move! lacochran - flowerpalooza! Yes it certainly is. Barbara - We planted a couple of bushes of a different strain of the same thing but now I want that exact tree somewhere else. It feels good to be back although it's going to take forever to pack. After a busy week playing-wise I definitely appreciate being closer in. The house is a happy sunny place and there's no mud or gravel on the way into the house. Krisin - Thanks, yes it's the best reason I could possibly think of to leave that tree. I mean it's going to take forever to UNpack - especially figuring out where to put Doug's gigantic tupperware collection. So if I'm not blogging it's because I'm busy organizing tupperware. 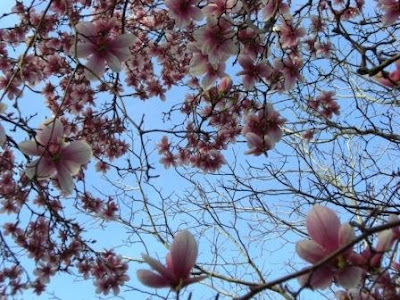 Your photograph of the magnolia tree is absolutely beautiful. After such a dreary day, it certainly is refreshing. Thank you Lyle - I guess it's those dreary wet days that make all of these blooms possible. I hope Donna is feeling much better now.